BizTalk 2013 Licensing – cheaper? Maybe, maybe not! Note this is not the official Licensing document for BizTalk Server! Please consult Microsoft before making any purchase decisions. With the BizTalk 2013 (english locale) SKUs hitting the Microsoft sites for purchase in April. It is important to note an important change Microsoft have made to the BizTalk 2013 licensing model. Up till now (i.e. BizTalk 2010), BizTalk followed a per processor model (ie a physical socket) . With BizTalk 2013, Microsoft have changed the model to be per core. Just like SQL Server. But what does core licensing mean? How does it affect your costs? For this, one must understand the concept of a core. 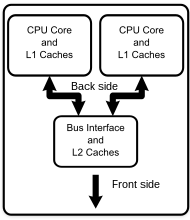 As per the wiki, a core is a central processing unit within a processor. So a dual core processor would have 2 cores, a quad core would have 4 cores and so on. The above is a dual core processor with 2 cores. The per processor model of licensing has its own problems. One could buy a processor license for a quad core processor and still end up paying for one processor and get the processing power of 4 processors. With the new model, a license has to be purchased for every core. That is 4 licenses would be required in this particular example. Core prices are costed as the 1/4 of the processor license cost. From the above, there is not much difference in this example. However, if you ended up using 5 cores for argument sake, what do the numbers look like between the two models? There you have significant cost savings for almost $30,000 with the new model! All the cores in the server must be licensed. Licenses can be purchased in pack of two. Actual number of core licenses required may vary based on processor type and core factor. The estimated price for a core license is approximately $10,835 for Enterprise and $2,485 for Standard. How do you calculate the cores? In order to calculate the cores, core-factor must be understood. A core-factor is different for different brands of processors. AMD: 12 cores x 0.75 = 9 core licenses required. Intel: 12 cores x 1 = 12 core licenses required. From the above, it is apparent that the licensing costs entirely depend on how BizTalk Server is deployed and the type of hardware. It affects different companies in different ways.